The lake is calling so my family must go. Arizona is a home to many wonderful lakes. These are the lakes in Arizona that my family always hangout with. And it is bucket list worthy! Lake Havasu is located in the Colorado river between Arizona and California. It took us for about 3 hours to travel by car from Anthem Arizona. There are many things to do in Lake Havasu. Many families go in boating, camping, kayaking, sailing, hiking and many more. It is the popular spot for jet skiing. You can bring your own jet ski or you can rent. Would you like to buy your own jet ski? I highly recommend Jet Ski Unlimited/JSU Kawasaki. A family-owned and operated business kawasaki dealer located at 2030 W Deer Valley Road, Phoenix Arizona. For more info. dial (623) 581-1620. Visit their website https://www.jetskiunlimited.com to see more variety of powersports products. Another lake that is favorite of my family is Lake Pleasant. It is located in Morristown Arizona. It is the nearest lake that we can go for just about 30 minutes to drive from Anthem where we live. We took I-17 to Carefree Highway (SR 74). Exit Carefree Highway and travel west 15 miles to Castle Hotspring Road. Then travel north to Lake Pleasant Regional Park entrance. If you don’t have a jet ski, there are many jet ski rentals in the area. Come to Lake Pleasant for a great vacation or weekend full of fun and relaxation. Bartlett Lake is located 40 miles from Anthem Arizona. It took us about an hour drive to Bartlett lake. It’s a wonderful lake to hangout with family. Your family for sure will have a fantastic day! My husband always participates in a jet ski race held at Lake Havasu wherein last year he got the third place in “Mark Hahn Memorial 300” jet ski race. By July this year, he will be joining the jet ski race at Long Beach California. My husband taught me how to operate the jetski. From starting the engine, how to go forward and go backward and how to control the jetski. The most important is how to ride safely and make sure that your jetski is functioning well. As you couldn’t imagine having fun in the middle of the lake and suddenly your out of gas. We always have an extra of 2 big gallons of gas in the trailer. We’re not afraid to go in the water since we know how to swim. But, even if we know how to swim everyone needs to wear life jacket as it is required by law if you ride a jetski. If you get fall, life jacket will get you afloat. Wearing life jacket could save your life. And we always make sure to put the jet ski lanyard. Lanyard will off the jetski if the driver falls into the water. My husband always put a long rope on his jet ski. One time there’s a family jetskiing on the lake and they run out of gas, my husband help them using the rope. He tied their jetski on my husband’s jetski and brought them to the shore. There are a lot more of important things like whistle, gloves, helmet and wet suit. When you ride on a jetski make sure to bring bottled water too because you don’t want to go back to the shore just to drink water. Jet skiing is so much fun. We always have amazing time with my family jet skiing in the lake. Our daughter who is now 13 years old, loves riding the jet ski too. In fact she’s not scared to drive the jet ski alone. Riding on a jet ski is just like riding a motorcycle but it doesn’t have a brake. So know your speed limit and stopping distance. It’s hard for me to control especially on rough water. Just like riding a motorcycle or car you need to see the surrounding and don’t just focus in front of you because there are a lot of jet ski rider around. Be vigilant and alert while you are in the water. Everytime we visit Lake Havasu we always make sure that we have the flag, fire extinguisher on our jet ski for there’s always a Water Patrolman around the area especially at London Bridge. Make sure not to go fast if you’re riding jet ski on that area. There’s a speed limit and you’re not allowed to make a wave. So set your jet ski into neutral or else the water patrolman will give you a ticket. Be aware also in every parking area. In lake Havasu Park, the speed limit of driving your car is 5 mph. From our experience, we don’t see the speed limit sign at the park. As we get out from the park and ready to go home, the police officer is just hiding at the restaurant chase us and said that we are over speeding and he gave us a ticket. I’m just giving you a hint especially to those who are not from Lake Havasu like us. Know the rules and regulations in riding the jetski. During our first visit in lake Havasu, as we are having fun jetskiing, the water patrol officer call our attention. He talked to my husband asking the age of my daughter since my daughter is driving one of the ski, the permit of our jetski, if there’s a flag, fire extinguisher and the number of the jetski which is smaller than what’s on their rules. Just sharing with you our experience in Lake Havasu. I am not an expert in riding a jetski, I am just a beginner and sharing what I’ve learned from my husband. Hey you have described your jet-skiing experience on different really good through your article. Thanks! I’m learning from my husband. Jetskiing is so much fun. Jet skiing is adventurous and fun. I agree with your thoughts on knowing and following the rules to keep your loved ones safe! Thanks! Safety is really the most important. This looks like so much fun! I love Jet Ski’s, we are from Florida and we ride them frequently. Thanks Evelyn. Wish to visit Florida someday. It’s true jetskiing is so much fun. Awesome list of lakes to check out! Amazing! Glad you and your family had a great time. This post made me miss jetskiing a lot. Now hubby knows where to take me next weekend. Thanks Crisly! It’s our bonding. I’m glad my daughter loves it too and not scared. It sounds like you and your family had a great time. I have to admit jet skiing is definitely on my list of things to do one day, it just looks like so much fun. What a cool post to start the day with! Loved your experiences – I have jetskiied only once, but can’t wait to do more of it. Jet skiing is a lot of fun! We bought some when my kids were younger and used to take them out on a lake all of the time. I haven’t been to Lake Havasu in several years, it may be time for a trip back soon! Agreed, know the regulations. We jetski in the bay in NJ and patrol comes by a lot to make sure we have the proper registrations, etc.. and our friend’s were dinged for not having their lifejackets on. I’ve yet to travel to Arizona! But when I do, I’ll have to check out some of these lakes. Sounds like an awesome family friendly time. Thanks for sharing this tidbit now everyone can look up the lake next time they’re in the area. Thanks for reading sir Ben. 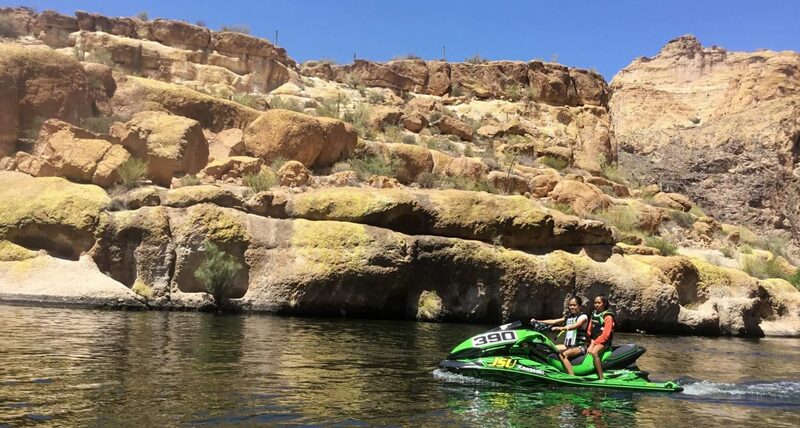 It’s time for you to ride on a jetski again 🙂 There are many lakes here in Arizona and it has amAZing view. This sounds like so much fun! I’ve never tried jet skiing but this looks like a great place to give it a go. My kids would have a blast! Hi Christine, I’m sure your kids will love it. My 13 year old daughter is enjoying the jet ski. Jet skiing looks so fun! I never knew how long it was. I bet it is exhilarating to fly through the water, wind in air. Good to know about the safety items to keep in mind. Thanks!! I don’t ride so fast since I’m still scared as the jet ski don’t have a brake haha! Still need to practice more and try to fly through the water. Thanks for reading Evelyn. I’m right there with you! I did go camping at Lake Havasu a couple of times. I absolutely love it. Those are great tips. I’ve always wanted to go jetskiing. It looks like you all had a great time. That jet ski looks like a lot of fun. I have never gone before! Jet skis look like so much fun to ride on but yes safety is the priority. That is so cool that your husband is participating in the jet ski race in Long Beach! It looks like so much fun! Have you noticed that the best vacations happen around water? Oh wow this looks like so much fun!! It looks like you had such a great time, I would love to try jet skiing! I love jetskiing (I actually lived on a lake in Northern Arizona when I was in junior high). Looks like you guys had fun. Thanks for the tips!